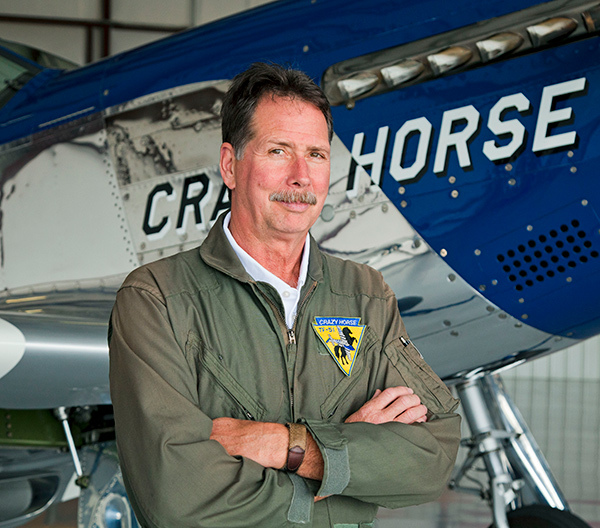 At Stallion 51 Corporation, Steve Larmore serves as the chief Texan instructor, instructor in TF-51 Mustang and a mechanic for our Texan and Mustang aircrafts, bringing with him over 45 years of flight experience. Steve received his private pilot’s license when he was only 17 years old. Following college, he started his aviation career working as a lineman and apprentice aircraft mechanic while pursuing his pilot ratings. After achieving an A&P mechanic and commercial pilot rating, Steve gained experience flying hundreds of hours in tow planes, biplanes, various aerobatic airplanes and gliders. Steve’s 14,800 hours of hands-on flight time include 4,003 hours of sailplane and motorglider flying and over 4,700 hours in the T-6 Texan/SNJ. Steve has been flying, teaching and maintaining the T-6 Texan for 24 years. He has served in the roles of chief pilot, chief instructor and director of maintenance. His instructional experience includes training T-6 line pilots and teaching one-on-one air-combat maneuvering in the Texan. At various periods during this time, he has held a low-altitude aerobatic waiver in gliders, Globe Swifts and T-6 Texans. WHAT ARE YOU WAITING FOR? FLY THE TEXAN TODAY! Contact us today to schedule your T-6 Texan flight.